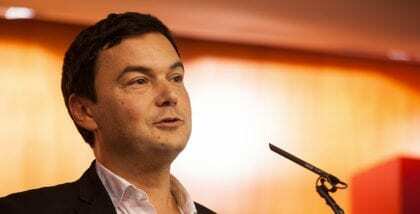 Renowned French economist Thomas Piketty, best known for his 2013 book Capital in the Twenty-First Century, has been making headlines for his positive comments regarding basic income in a number of blog posts. However, the approach he proposes is not basic income as it is commonly understood. In a blog post published on 13 December, Basic income or fair wage?, Piketty states that while he’s pleased to see such consensus across the political spectrum on the idea of a minimum income within France, discussions of a basic income and its specific level are not radical enough – that such conversation “leaves the real issues unexplored and in reality expresses a concept of social justice on the cheap.” He points instead towards progressive taxation, fairer approaches to education and fair pay and control within corporations as topics deserving focus. Returning to the question of basic income, Piketty raises what is essentially an important administrative concern. He notes that, at present, employees earning the minimum wage rate in France have their taxes and social contributions deducted from their wages at source, putting their net wage below the threshold for social assistance. However, the worker must herself apply and wait several months to receive the social assistance necessary to bring her income back up to the minimum level. Piketty seems to be concerned that such inefficiencies and poverty traps would proliferate under a basic income scheme. Then, on 25 January, a collection of prominent researchers, including Piketty and famous sociologist Dominique Méda, published in ‘Le Monde’ a call in support of Benoît Hamon’s basic income proposal – Pour un revenu universel crédible et audacieux [For a credible and audacious universal income]. Some news organisations quickly followed with headlines claiming Piketty had endorsed basic income, yet the scheme it describes is not what we would ordinarily understand as basic income (and certainly strays from BIEN’s definition on a number of points). However, as we have covered here and here, Hamon does indeed hope to ultimately offer a full basic income, and while his steps towards such full implementation have been modified somewhat over the course of his campaign, the first step he proposes is for a basic income to be paid to those between the ages of 18 and 25, unconditional on resources or low wages. A two-speed social security scheme? Piketty’s administrative concern again arises here, with the authors claiming that “it would hardly make sense to pay 600 euro a month to those earning 2000 or 5000 euro a month, to then immediately take back the same amount by increasing their taxes.” This leads the piece to end with an argument for “basic income” to be provided essentially as tax credits on the payslips of the stably employed. Piketty claims, however, that direct payment of an income top-up on stable employees’ payslips is to be preferred, where feasible, because it links the idea of basic income with that of a fair wage and because, in practical terms, he does not believe the basic income payment would be as simple and automatic as the top-up. MFRB have laid out a number of responses to Piketty’s comments here. This includes a useful side-by-side comparison of one of MFRB’s basic income proposal and Piketty’s suggested scheme, and an analysis of the potential perverse effects of the latter. A common thread through these three articles seems to be Piketty’s belief that basic income, when implemented, would amount to a mere increase of the amount of money eligible citizens could apply for, with no change to its bureaucratic system of administration. He then repeatedly contrasts a system whereby the full “basic income” is listed on stable employees’ payslips, along with the relevant taxes that partially or fully outweigh this amount, with his preferred system of simply listing the balance, if any, owed to the worker. This preconception of how basic income would be implemented seems to be partially motivated by his own preference regarding the message a basic income would communicate: that work is valuable, and basic income is a way of offering a just salary and equitable remuneration for work. He also espouses a belief that working life won’t change in response to automation and “Uberisation” as much as others suggest, so we should prefer top-up payments on payslips to a separate, standardised basic income system for all, paid directly by the government. In this way, while Piketty begins by chastising basic income proponents for lacking radical vision, he ultimately endorses just a minor part of the basic income proposal – that of automatic payment. And while, in the joint letter, we are entreated to offer a concrete basic income proposal, the system put forth caters only to a subsection of the population, with hand-waving regarding how this would connect to basic income for the rest. Thomas Piketty, “Basic income or fair wage?”, Le Monde, 13 December, 2016. Thomas Piketty et al., “Pour un revenu universel crédible et audacieux” [For a credible and audacious universal income], Le Monde, 25 January, 2017. Thomas Piketty, “Notre revenu universel est-il vraiment universel?” [Is our universal income really universal? ], Le Monde, 30 January, 2017. Jean-Éric Hyafil, “Commentaires sur le ‘revenu universel’ de Thomas Piketty” [Comments on Thomas Piketty’s universal income’], Le Mouvement Francais pour le Revenu de Base, 2 February, 2017. Adrien Sénécat, “Revenu universel : Valls et Hamon se disputent la référence à Piketty” [Universal income: Valls and Hamon disagree over Piketty’s reference], Le Monde, 26 January, 2017. Stanislas Jourdan, “FRANCE: Pro basic income candidate set to win socialist primary election”, Basic Income News, 25 September, 2016. Genevieve Shanahan, “FRANCE: Hamon becomes Socialist Party presidential candidate following basic income-focused campaign”, Basic Income News, 30 January, 2017. I don’t think he gets it either! He seems to still be locked into the perception that paid work is the most important thing in the world and the UGI is just a supplement to this. I disagree with that essential premise; the attraction of a UGI for me is that it has the potential to break up the crushing christian work ethic, which has had its day and redefine work as potentially any human activity that is meaningful and useful. I don’t know Piketty. He is coming across as an ill-informed opportunist. The big thinkers on UGI are André Gorz and Zygmunt Bauman. It is supposed to be transformational, especially when aligned to radically reduced working hours. I would add Philippe Van Parijs to your list. He is the one who managed to convince Gorz, who was initially strongly against the idea of UBI, to endorse it. Piketty is correct to be cautious about where the money to pay for universal basic income would come from. As he says, it makes little sense to give a supplement of 500 Euros per month to someone making 2,000 Euros per month by paying for it by taxing him or her by an extra 500 Euros per month. At least a partial solution to this problem would be to charge a fee on fossil fuels and then return the money raised to everyone as dividends – the carbon fee and -dividend advocated by climate scientist Dr. James Hansen, Citizens Climate Lobby and others. Your comment is strange. Of course anyone defending the idea of UBI, also defends the idea of raising taxes simultaneously to fund UBI. An those earning 5000€ per month would of course be net loser in this scheme – but this is not a bug, this is a feature. “transformational” is the word, thank you Conrad. Piketty takes a technocratic approach. Where UBI must win is the normative approach, showing how UBI is not about jobs and wages alone, but a new vision for the capitalist economy, including a new ethos.